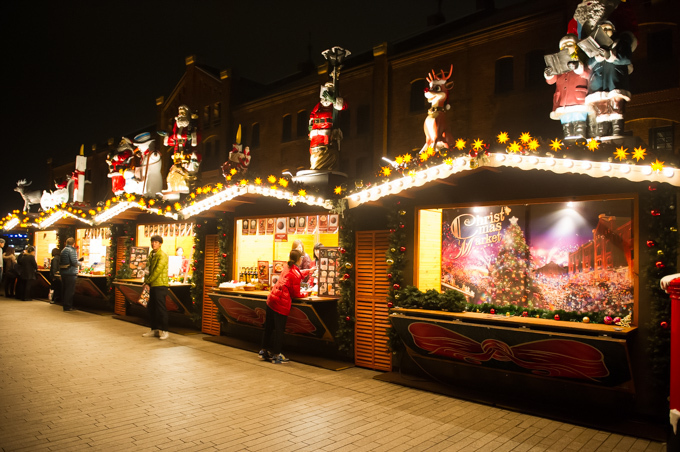 It was 2010 that the Christmas Market in Yokohama Red Brick Warehouse was held for the first time. The other day, on Nov 26, 2016, the event this year has just started, and will last until Christmas, Dec 25,2016. About 650 thousand people visited last year, 2015. Now, let me show you Christmas Market 2016 in Yokohama Red Brick Warehouse today. Let’s check it out ! 5 A Santa Clause will come to Yokohama Red Brick Warehouse ! This popular event is a market originating in Germany and limited in Christmas. The atmosphere in Red Brick Warehouse is so romantic in warm color lights ! It is called “ Weihnachtsmarkt “ in Germany, and the foods and goods related Christmas are sold in this market. There is no entrance fee ! There is a fir tree with a height of 10 meters with luxurious illumination in the center of the market. In the lighting ceremony held on Nov 25, the day before the opening, a snowman lighting switch made of real snow appeared. The first attempt of the snow has done this year, which is the seventh opening event, with the theme of “ White Christmas “. An artificial snow falling event “ White Christmas “ was held on Nov 25, and will also be held on Dec 2, 9,16 and 24. After passing through the tree-lined street of the Christmas Lights, a Christmas market with “ Hutte (tree stands’) ” which were brought from Germany appears. It’s as if they were real ones. They sell Christmas goods and warm drinks and foods at the stand. Winter is a season of sweets ! It is a tasty Baumkuchen. A workshop is held in Christmas Market. There are three course in the workshop. Making a Christmas lease, a mini tree, and ornaments. The schedule of making a Christmas lease is 14:30～17:00, Nov 29, Dec 6, 9. The date of mini tree is 14:30～17:00, Dec 1 and 8, and of the ornaments is 14:30～17:00, Nov 30. It costs 2,600～4,000 yen of entrée fee. A Santa Clause will come to Yokohama Red Brick Warehouse ! Wow ! Santa will come to Red Brick Warehouse ! It’s Dec 2, 3, 7,10,14,17,21,24. If you are lucky to meet Santa Claus, you might get a nice present. This Christmas Market is recommended not only couples but also one person because everyone can enjoy it. Let’s enjoy Germany feeling here to your heart’s content ! The advent of thicker ‘Green Tea’ which you can make with simply shaking and mixing water and powder tea Starbucks Japan Debuts The Baked Cheesecake Frappuccino The newest product by Komeda Coffee, ‘Golden Iced Coffee’, is catching the public’s fancy right after being on sale! 5 most popular smoothie made in Natural Lowson What is ‘Wide FM’ which can be used by the latest CD-radio-cassette player by Panasonic? Useful cosmetics sold in Japanese 100 YEN shop Japanese idol is still lively! up-and-coming idols Let’s take a memo everywhere you want by “Phree”!